However, before we become true pilgrims, walking toward sobornost and inviting others to join us, Catherine says that we must first enter poustinia. Poustinia is being set apart for God. Literally, it can be a cabin where one goes to fast and pray to be purified of the things that separate us from God. Figuratively, it is entering into one’s own heart and setting it apart for God. The former assists the latter, but it is not, Catherine says, essential to poustinia that we go to an isolated cabin. Then, she says, “when the poustinia has cleansed me totally, has opened me to God and to others, when I have committed myself to God—the Lord of History, the Triune God—then I can leave all things behind and move on the pilgrimage that God has called me to” (Strannik, 18-19). Last summer fifty pilgrims set out from Our Lady of Fatima Parish, Renfrew to spend three days on a prayerful journey to St. Ann’s, Cormac for the annual pilgrimage. 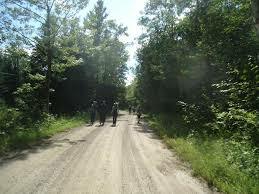 Thanks to the generosity of many people, St. Ann’s “Walk the Opeongo Line” Pilgrimage was a success. There were some bumps along the way and not everything went according to plan, but that’s all part of the pilgrim experience. Catherine writes, “The pilgrim is totally open; he is not afraid of persecution. He accepts persecution because he is a follower of a persecuted God. A pilgrim is a person of pain. If he is not ready to accept pain, he cannot be a pilgrim. Pain walks with him night and day. But strangely enough, joy does too” (Strannik, 48). We began the journey seeking to deepen our relationship with God, and He took advantage of the time to teach us many lessons.